Rookie George Rodney kept his place atop the podium with an acrobatic win at the Haines stop of the FWT. PHOTO: Freeride World Tour. Weather finally relented in Haines, Alaska, and, after three thwarted attempts, the Freeride World Tour went off in the Chilkat Range on one of the biggest venues in FWT history. 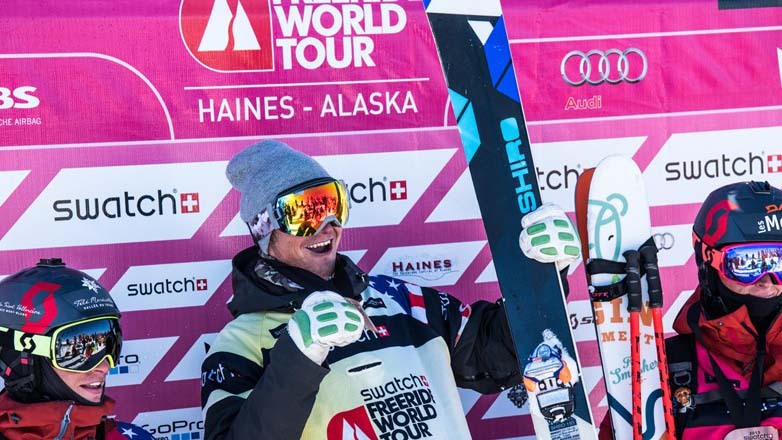 In the end it was American rookie George Rodney taking his second victory in a row for the men, while the ladies side saw Italian Silvia Moser come away with a win ahead of next week's Tour finale in Verbier. Monday's action also clinched the first overall FWT title of 2015, as Austrian Eva Walkner's second place finish was good enough to take the women's ski crown. The Haines event was the first ever FWT stop in Alaska and the circuit's only in North America this year. It offered up a staggering amount of logistical challenges including shuttling athletes, organizers, and crew to and from the venue in helicopters, building the competition base camp on an exposed and isolated ridgeline, and extending the competition an extra day after an unprecedented 10-day weather window failed to materialize. The wait was worth it, as competitors skied the close to 3,500-vertical-foot course in blower conditions and brilliant sunshine. Deep snow undoubtedly affected the speed of many riders, but turns were deep and landings forgiving. After an acrobatic recovery on a double stage cliff up top, the 21-year-old Rodney skied strong through the rest of the course, using his wiry frame to fly through transitions and come out unscathed where many before him had tumbled. Close on his heels was Swiss skier Jeremie Heitz, whose reputation as a charger preceded a virtual straight line down the steep Alaskan venue. Rounding out the top three was Frenchman Kevin Guri with some nifty maneuvering through a technical lower cliff. On the ladies side it was a series of 'what ifs' as American Hazel Birnbaum nearly stomped a massive double stage cliff, and Lotten Rapp of Sweden just couldn't hold onto her run out. In the end it was Italian rookie Silvia Moser that ended up on top, followed by Austrian Eva Walkner, and American Francesca Pavillard-Cain. For Walkner the day held particular significance, as her second place was all it took to claim her first FWT championship after being sidelined for two seasons due to injury. So where do we go from here? The FWT finishes up its 2015 season in Verbier at the legendary Bec de Rosses, and though the women's field is wrapped up, the top six in the men's field are in the hunt, including 2013 champion Drew Tabke. Women's and men's snowboarding are also open competitions heading into the FWT finale. A special mention needs to go out to the FWT athletes, who for 10 taxing days battled the mental ups and downs of three postponements on one of the most challenging competition venues ever dreamed up by the big mountain series. There was a little bit of skiing during this downtime, but a whole lot more cross-training, reading, disc golf, hacky sack, and whatever else competitors could think of to stay sharp ahead of the monumental stop in Alaska's heli ski mecca. It may seem trivial, but anything helps when you're preparing for the one run down a 50-degree spine section that determines if a whole season of hard work was worth it. The next few days will be spent crossing the pond for the 2015 FWT's final hurrah in Verbier, Switzerland, where three more world champions will be crowned. Action kicks off March 27.